From the Baldwin County Courthouse, go west on Hancock Street for 2 blocks or 0.2 mile (or the one large block containing Georgia College & State Univ.). Turn right on Clarke Street. Go one large block or 0.2 mile. Turn left onto Highway No. 22 (west) or Montgomery St. Go about 10.3 miles or 3.5 miles past Watson Rd. - you should be near the Baldwin-Jones County line. 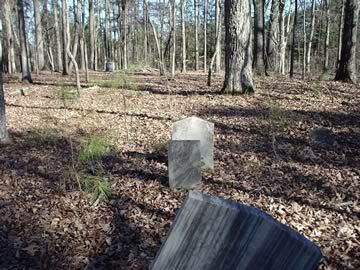 Cemetery is on the left in a fenced-in area in the woods. Approx 150 ft from highway. Can be seen from highway only in winter. Is at the address of 708 Hwy 22. 1st Sgt. Co. K, 42nd Ga Inf. April 26 1865, per RCSG.